IF the fermentation trap is the winemaker's best friend, it is certainly run a close second by the hydrometer. A hydrometer is by no means essential to the production of good wine, but it is a great help, particularly if one is aiming at consistent results. (d) calculate the strength of the finished wine. The word hydrometer means "water-measurer," but in this instance it would be more accurate to call it a saccharometer, or "sugar measurer" for the basic purpose of the instrument is to discover how much sugar there is in the liquor. Fermentation, as has been explained, involves the conversion by yeast of sugar into alcohol and carbon dioxide. If, therefore, we can discover how much sugar is used up during the whole course of a ferment, we can calculate exactly how much alcohol has been produced, how strong the wine is. The more sugar there is in a liquid, the thicker or denser it will become, or the greater its gravity will be: The better, too, it will support anything floating in it; the hydrometer makes use of this principle. To measure different gravities, we naturally need a scale of some sort, and an obvious and convenient standard from which to start is that of water. Water is therefore given the arbitrary gravity of 1.000, other liquids are compared specifically with this, and the resultant figures are said to be their specific gravities. Thus liquids heavier than water (or, in our case, containing more sugar) may have specific gravities such as 1.050, 1.120 or 1.117 degrees. When talking of gravities, however, we omit the first "1" and the decimal point. Therefore the specific gravities quoted are exactly the same as gravities of 50, 120 and 117 respectively: Gravities are the same as degrees Gay Lussac (deg. G.L.). For winemaking you will need hydrometers, or perhaps one hydrometer, covering the range 1.000 to 1.160, and it is often useful to be able to go several degrees below the 1.000.
to 1.200. You will then be equipped with hydrometers the gradations of which will be larger and more readable. Messrs. W. A. E. Busby, however, produce one which is specially designed for the winemaker and which allows one to calculate the strength any wine has attained without reference to tables or graphs, which is most useful. This hydrometer has the specific gravity and the potential alcoholic strength scales side by side, and it costs no morn than an ordinary hydrometer. Moreover, it covers the whole of the scale, 0.990 to 1.170, that the winemaker is likely to need, and is therefore ideal for our purpose. Semplex and Messrs. H. T. Ellaway also have specialised models. A hydrometer is a glass tube (with a bulbous lower end) containing the scale, and it is weighted at the bottom so that it will float upright in a liquid. The reading is taken when the level of the main surface of the liquid would cut the scale. The thinner the liquid (the less its gravity) the deeper the hydrometer will sink in it; the denser the liquid (the greater its gravity) the higher the hydrometer will float, and the more of the scale will protrude above the surface. Therefore the scale of figures in the hydrometer is "upside down," the smallest being at the top and the largest at the bottom. In water, of course, the hydrometer will float with the 1.000 mark level with the surface; as you add sugar so the hydrometer will rise is the liquid. If, on the other hand, you add instead to the water a liquid lighter than water—alcohol, for instance—the hydrometer will sink below 1.000. To use your hydrometer, pour some of the juice or syrup to be measured into a hydrometer jar, or any transparent container that gives sufficient depth and ample side clearance. Spin the hydrometer to get rid of any air bubbles clinging to its sides, which can seriously affect the reading. When the hydrometer is still, take the reading, with the eye at surface level. Note that hydrometers are designed to be read when the liquid is at 59 deg. F., and, strictly speaking, if it is at any other temperature, you should allow for it as shown in the table below. Omit the "decimal point" of the specific gravity and make the correction to the last of its four figure. 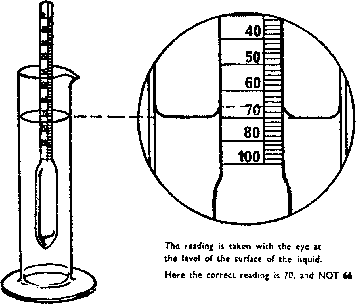 Example: A hydrometer reading of 1140 at 86 deg. F. should be corrected to 1143.4. When you have measured the specific gravity of your juice or liquor, you can tell from the table below firstly how much sugar per gallon it contains, and secondly, how much alcohol (in terms of the percentage of alcohol by volume): it is likely to produce, i.e. you can assess its potential alcoholic strength. This, remember, on the assumption that the wine ferments right out, and that all the sugar is used up. There may be some obscuration, or unavoidable inaccuracy, at either end of the scale, caused by solids initially, and alcohol finally, but these figures give a practical working basis, and a deliberately conservative estimate of potential alcohol. Let us assume that you wish to make a wine using a diluted fruit juice. Having extracted the fruit juice and diluted it with water as required, take the S.G. of it. Let us assume that you obtain a reading on the hydrometer of 1.040. This means, if you look at the table for a moment, that there is already 1 lb. 1 oz. of sugar present in the natural juice and that if you fermented it you would finish up with a dry wine of 5 %. alcohol by volume. This would probably not keep (under 10 % it cannot be guaranteed). So you. now have to decide how strong a wine you wish to make. One can, of course, make a weak wine of, say, 5 %, but it would have to be drunk young, and most winemakers prefer to make table wines, which are usually of about 10-12 % alcohol, or stronger wines of up to 17 %. For wines of above the latter strength, say for drinking after a meal, one must resort to fortification. Say you deride to make a dry wine of 16 % alcohol. The table shows you that this will require an initial S.G. of 1120, or a sugar content in the gallon of 3 lb. 2 oz. You already have 1 lb. 1 oz., so that you need to add 2 lbs. 1 oz. of sugar, and make the quantity up to 1 gallon with more juice of the same dilution. Alternatively, you can take 1 gallon of the juice and, in order to get the extra 80 degrees gravity required, add 2 lbs. 6 oz. sugar, in which case you will finish up with 1 gal. 1 pint 3 ozs., because of the extra bulk of the sugar. You can, of course, add all the sugar of the outset, as long, as you ensure that it is thoroughly dissolved, and, if you then check with your hydrometer, the S.G. should be in the region of 1.120. Add a tittle of the sugar at a time to be on the safe side, testing as you go. A simple approximation is that 2 V oz. sugar will usually raise the S.G. by 0.005 (5 degrees). You then add your yeast nutrient and ferment in the usual manner. As the ferment proceeds the S.G. of the liquor will drop, rapidly at first, and then more slowly, and you can gain a good idea of its progress by noting the rate of drop. As it nears the 1.000 mark it will be very slow indeed. It may reach the 1.000, and may even drop below because of the presence of alcohol, in which case congratulate yourself upon having produced a really dry wine! To calculate the final strength of the wine, write down (omitting the decimal point) the S.G. at the start of the ferment (i.e. after the sugar was added). Subtract from it the final S.G., and divide the answer by 7.36; that is the percentage of alcohol. by volume in your wine. Multiply that by 7/4ths and it will give you the strength as proof spirit. Multiplied by 7/4ths = 29.2 deg. proof. It is always good practice in winemaking to add the sugar by stages, but winemakers are often puzzled as to how they can do this, yet still use their hydrometer to obtain the information they want as to their wine's strength. It is easy enough if one bears in mind all the time that the principal factor with which one is concerned in calculating the final strength of a wine is the total drop in specific gravity. The sugar can therefore well be added a few ounces at a time as long as you keep a record of the number of degrees drop between successive additions. Then add up the various drops, and this is the figure to be divided by 7.36 in the usual way. This will in normal cases give an approximate result which will be accurate enough for the average winemaker, but where large quantities of syrup are added it can be seriously adrift because it takes no account of the volumes involved. When you have worked out what percentage of alcohol you have obtained by the first drop, you then proceed to add sugar or syrup. This produces more alcohol, but its bulk also dilutes the alcohol you have already produced, so you must modify the calculation already done. Similarly the drop from the second lot of sugar must be modified, and so on. Suppose you start with an S.G. of 1100 and, after three or four days, strain into a one-gallon jar and obtain 5 pints of liquid. Some time subsequently the S.G. is found to be 1000, i.e.. a drop of 100. Since a gallon is required you "top up" these 5 pints, bringing them to 7 ^ pints with an S.G. of 1010. After another period the S.G. drops again to 1005, so once more you top up with syrup or sugar to obtain a full 8 pints with an S.G. of 1010. The S.G. finally drops to 1005. Using the rough-and-ready calculation above gives a total drop of 100 + 5 + 5 = 110. This one divides by 7.36, giving a result of 15 % alcohol by volume. To this 67 is added the final drop of 5, giving a total effective drop of 67 + 5 = 72. This represents just under 10 % alcohol by volume, as against 15 % by the crude method. Admittedly this is an exaggerated case and does not illustrate good winemaking practice, but it does illustrate the mathematical point. 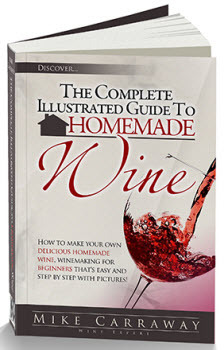 A good general rule is that a really dry wine will often need a starting specific gravity of about 1.085, a medium sweet wine one of about 1.100, and a really sweet wine one of up to 1.125. Always remember that it is better to use too little sugar initially than too much; a dry wine can always be sweetened; an oversweet wine is hard to redeem. Make your wines dry, and sweeten them to taste when finished. Another useful point to note is that if you wish to reduce the gravity of a liquid, it can be done by dilution. The addition of an equal quantity of water, for instance, will reduce the gravity by half. SOMETIMES you will want to fortify a wine (raise its alcoholic content by adding spirit) and, since spirit is expensive, you will need to calculate exactly how much to add to achieve the desired result. Do so by means of the Pearson Square (or St. Andrew's Cross) but note that all measures must be of the same sort, i.e. degrees Proof or % alcohol by volume; do not mix them. 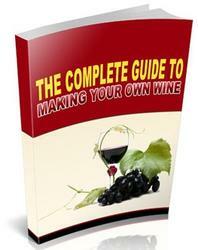 The proportion D to E is the proportion of spirit to wine to achieve the desired strength. How To Reading A Hydrometer?